Would you like you, if you met you? I published this image with a blog some time ago, and talked about how it is our responsibility to care for our own needs, happiness and health included. 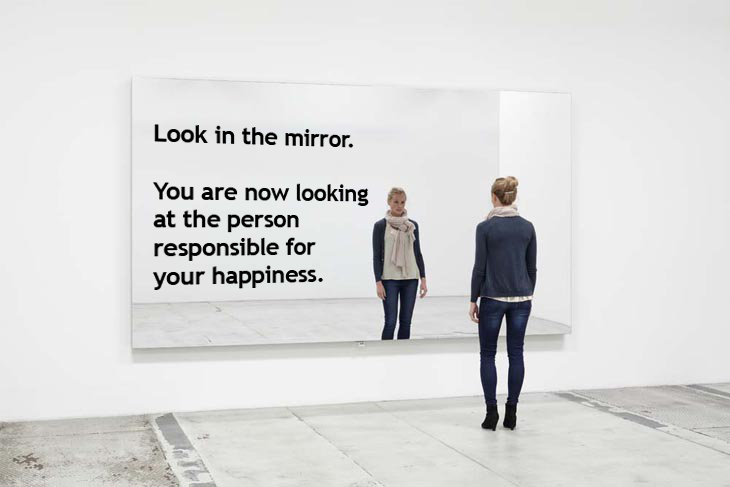 I firmly believe it is up to us, although looking in the mirror with complete honesty can be quite painful, and taking responsibility, for everything you feel, is often hard to do. Surely it is also our responsibility to ensure we are the people others would be happy to spend time with, and would like and respect. Not for their affection, but out of respect for them. It is not enough to love ourselves, and not care about anybody else; we are not islands, and our actions do affect others. This is an interesting question, and possibly one some people might not wish to dive into. I wondered about the question of liking myself, if I met myself. I’m pretty sure I would, although wonder if sometimes I can be too self-centred, and focused on my own life and goals too much. Writing about this has made me want to work harder at spending more time with my husband and sons, and less time using the “Too busy” basket when they ask for something. Regularly this year I have deferred one son from some time we had promised each other, only 2 hrs/week for 12 weeks, due to being too busy with other things. In retrospect, I should have been too busy to say yes to the other things that cropped up, and said no. But… I hear myself saying, things sometimes crop up out of the blue, opportunities too good to miss for whatever reason. Is that a good enough reason to miss out on the pre booked and planned time with my son? The trick here is not to be too hard on myself (or others), and accept what each day offers and how I’ve ultimately decided to deal with it on that day. This is not always easy. My son says, “Don’t stress about it mum” and has often also said, “I’m really proud of you and all the work you do” which is definitely music to a mother’s ears! He sometimes cancels our weekly get together too… perhaps we’re related!!?? I’m really proud of both my sons, no matter what they are doing, and don’t only love them but also like them. My dream for them is that they learn to love – and like – themselves too, as this can make what life throws at you so much easier. December 23, 2013 in Daily Blog. Tags: Author: Kate Swaffer © 2013, Too Busy basket, Would you like you if you met you? ← My thoughts on how to be a writer? They are very profound words Kate, and something that is good to reflect on. I have printed it out to give to my girls – 3 lovely young adults, all very different and all at times, doubting themselves and beating up about things over which they have no control – and which in the long run matter little. All three are loving, worthwhile human beings who are compassionate and caring. They need to be reminded from time to time what very special people they are. This year has been very difficult and stressful for me in many ways, and to have their understanding and support has been invaluable. I am so proud of them and love them to bits. Two have produced wonderful children – one on her own. She definitely needs reminding what an incredible job she is doing. One is a nurse and heads a trauma team in a major hospital – how do you measure that? The third is mother of 2 boys, works 3 jobs and has the warmest heart and the warmest smile in the world. How lucky am I, I must have done something right! Thank you Wendy, I hope your girls enjoy reading it too. Yes, you have done lots of things right, as they are doing too, and you have every reason to be VERY PROUD. PS did you get my email? This is a really interesting idea. I think it takes a lot to look inwardly and balance everything that you see. Nobody is perfect, and I guess being able to look into yourself (truly into yourself) means that you need to be able to look at your positives and negatives, and see how you feel about where you are at the moment. I don’t think I would like me if I met me, but I don’t like myself very much. Perhaps I focus on the negative aspects much more than I should.